The 2012 Distinguished Alumnus Award Ceremony was held at BridgeView on Thursday, April 26, 2012. 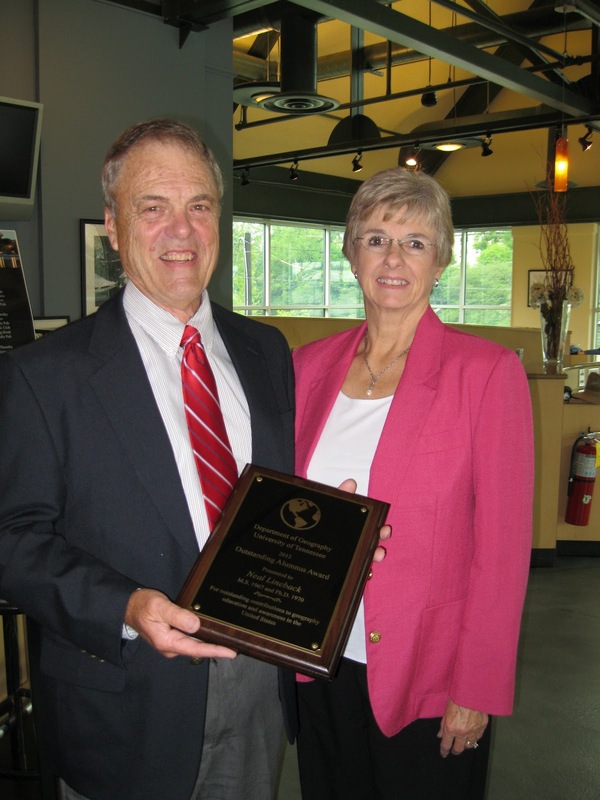 Our honoree as Distinguished Alumnus is Dr. Neal Lineback who is also the Hammond lecturer. After the departmental luncheon, Dr. Lineback spoke about his lifelong love of Geography (among many other accomplishments, he was the founder of the World Geography Bowl at AAG and SEDAAG). 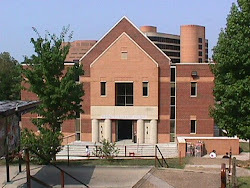 The Geography Department's 2011-2012 Award Ceremony was held at the McClung Museum on campus (Circle Park). on Thursday, April 26, 2012. The reception was in the lobby of the museum from 3:30-4:00 pm followed by the awards presentations in the McClung Auditorium. Kevin Krivacsy has been assigned to help with the maintenance of the department’s computers and labs in Fall 2011 and Spring 2012 as a graduate assistant of the department. He has carried out his duties, such as manning the lab, updating software, maintaining computers, etc., in a very professional and responsible fashion. While he has not had the instructional duties of a regular graduate teaching assistant, he often goes above and beyond in helping other students with GIS and other subjects. Moreover, his mild and humble manner makes students feel comfortable in working with/asking help from him. He deserves to be recognized with the Extraordinary Service to the Department Award for his contribution to the department. Kevin Russell has done an equal, if not better job, this year completing his duties as the teaching assistant in Geography 310 and assisting with map projects in the cartography lab. In Geography 310, he goes the “extra mile” to assist students with class assignments and maintains a good, approachable relationship with them. This is demonstrated by the time he has taken this semester to help one of our disabled students get through difficult lab assignments. He has again done an excellent job with his grading responsibilities and maintains the class records quite well. He has advanced his knowledge of GIS and developed a new lab assignment we used this semester based on isarithmic mapping techniques using ArcMap. In the Cartography Lab, he has completed map projects that have been used in professional publications for our faculty and faculty of other UT Departments. He is currently helping me research ideas and techniques that will improve the usefulness of the UT Campus Map. Kevin is a very dependable and self-motivated worker. His hard working, pleasant disposition make him a pleasure to work with and we would once again have to rank him among the top workers we have had in Cartography. Lecce, S.A., Pavlowsky, R.T., Bassett G.S., and Martin, D.J. 2011. Metal Contamination from Gold Mining in the Cid District, North Carolina. Physical Geography 32(5): 469-495. Grant L. Harley, Henri D. Grissino-Mayer, Jennifer A. Franklin, Chad Anderson, and Nesibe Kosë (accepted). Seasonal Cambial Activity of the Southernmost Native Pine in the United States Pinus elliottii var. densa. Trees-Structure and Function. Grant L. Harley and Henri D. Grissino-Mayer (accepted). Tree Rings as Environmental Indicators. Berkshire Encyclopedia of Sustainability, Berkshire Publishing Group, Great Barrington, Massachusetts. Dali Wang, Ziliang Zhao, and Shih-Lung Shaw, 2011. An Approach to Integrate a Space-Time GIS Data Model with High Performance Computers. 17th ACM SIGSPATIAL HPDGIS11, Chicago, ACM ISBN 978-1-4503-1040-6/11/11. Mathew Boehm has been an outstanding GRA for two projects this year: an NSF project directed by Sally Horn and Zheng-Hua Li, formerly of the Department of Earth and Planetary Science, that focuses on palaeoenvironments of the southeastern U.S., and our Initiative for Quaternary Paleoclimate Research (IQPR). For the NSF project, Matt has analyzed pollen and other proxy indicators in a sediment core from White Oak Bottoms, North Carolina (his MS thesis), and has investigated several other sites in the SE that are now or will become part of the NSF project. As a GRA for the IQPR, Matt has contributed to a diversity of seed projects, especially in collaboration with faculty and students from the Department of Anthropology. Matt has also contributed to work on fire history in the Florida Keys funded by the U.S. Fish and Wildlife Service, a role that has included supervising three undergraduate students in the Laboratory of Paleoenvironmental Research. 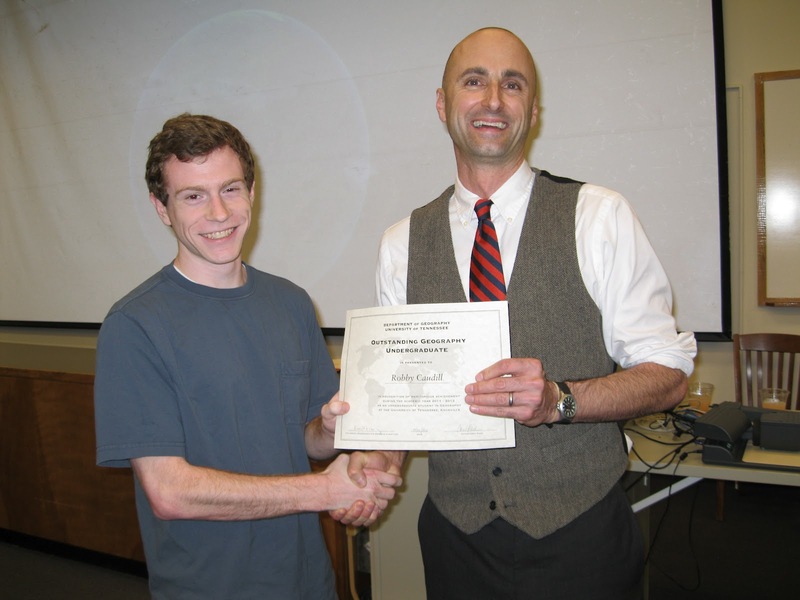 During Fall 2011, Matt shared his expertise with tree ring and soil charcoal analysis with students in the Geography 137 honors version of our introductory physical geography course, working with Joanne Ballard to offer field and laboratory experiences to the students. As GRA for an NSF project on paleoenvironments of the Cuatro Ciénegas basin of Mexico directed by Sally Horn at UT and Tom Minckley at the University of Wyoming, Matthew Valente has gone the extra mile in pursuing work that is the basis of his Ph.D. dissertation, the M.S. research of John Eads, and other projects involving the PIs and other students and collaborators. This has included designing new laboratory protocols for sampling and preparing charcoal and pollen samples that are now being followed both at UT and the University of Wyoming, and for obtaining radiocarbon dates on selected organic fractions of sediment cores. Initially introduced to the potential of the Cuatro Ciénegas basin as a study site as a volunteer field assistant for a project led by Horn with funding from The Nature Conservancy, Matt helped expand the work and secure the major NSF grant that now funds the project. Matt also received an NSF doctoral dissertation grant to support the work. While serving as a GRA for the project, Matt has continued to contribute to seed projects of the Initiative for Quaternary Paleoclimate Research, for which he served as a GRA in 2011, and to various outreach activities in the Laboratory of Paleoenvironmental Research. Mike Meyers has been the lead GIS person in the Institute for Public Service’s County Technical Assistance Service. In that role he has trained officials in the use of GIS, worked with fire officials from around the country to develop better asset management, developed software for county road management, and spearheaded the development of the state data explorer which combines data sources from many agencies. It is fair to say that he has brought geographical analysis to counties throughout our state. His job requires both technical and political expertise. While carrying a heavy load in his full-time job he managed to complete a dissertation that consisted of building and analyzing data sets with over 90 million observations. Kassie Hauser was a Teaching Assistant in the Population and Environment course (GEOG 345) in Spring 2011, and she currently assists in the Cultural Geography course (GEOG 320). Kassie is an excellent Teaching Assistant: she is punctual and dependable, pays great attention to detail, and has good rapport with students. The easy contact with students becomes evident when Kassie joins small groups (3–4 students) to discuss cultural geography questions. She carefully listens to student input and gently steers the conversation if necessary. Students are regularly seen coming up to Kassie after lecture to ask a question or to let her know about something in the course. Kassie conscientiously grades student papers and exams, and she is open to suggestions to improve her grading. She reminds the instructor of important dates in the course, and notifies the instructor of students who are not attending class. These examples indicate that Kassie is highly aware of organizational and interpersonal factors that make a course work, and Kassie plays an important role in the organization and social fabric of the course. All three are very deserving of the title “Outstanding” Teaching Assistant. Jesse Piburn took over the GTA for 411 early this semester and was in charge of all three lab sessions on Friday. Before each lab assignment, he reviewed and modified the assignment carefully to make sure all functions/operations were updated to the new ArcGIS version. He also provided a clear explanation and expectation for each lab assignment. During the semester, he maintained a good relationship with students, so they felt comfortable to ask him any questions about the lab assignments. Jesse also regularly met with the instructor to discuss questions/problems occurred in the lab sessions. Jesse reviewed the GIS final project proposals proposed by students and graded exams and in-class exercises. For the proposal review, he made detailed comments and suggestions for each proposal. For the exams, he always finished the grading in time, so the instructor had enough time to review the exam in class. Overall, Jesse did a great job as the GTA for 411 this semester. 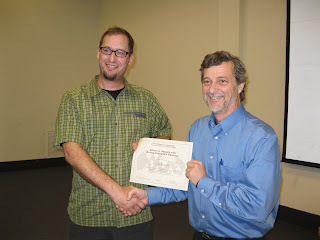 Michael D. Vanderlan is the GTA in World Geography Class (Geography 102) for Spring 2012. He is an excellent teaching assistant because of the following: (i) He is punctual in the class and pays attention to several details concerning the current and upcoming classes; (ii) After some discussion and training, he was able to perform very well, and constructed the map quiz study guides and quizzes that have been instrumental in teaching and instructional support; (iii) He asks the instructor for help and assistance regularly so as to make the teaching experience pleasant; (iv) He is punctual and fair about grading several assignments/exams for the class; (v) He is very approachable by students as felt by his presence in the class. Michael comes from a technical/engineering background, and his learning curve was steep, but he exhibits fine qualities as a teaching assistant. Being a Graduate Teaching Associate for Geography 131 and Geography 132 is a bigger job than meets the eye, as it involves two different course preparations, large-enrollment classes, and leading one’s peers. We should award survival certificates for those who serve as Graduate Teaching Associates while they are still taking classes for their degrees, and we should especially recognize those who thrive and make excellent progress while teaching. Derek Martin has been a GT Associate in both Geography 131 and 132 this year, and he has done an outstanding job. Students call him a “great teacher” and “one of the best at UTK.” They applaud him for emphasizing learning, not memorization, and they appreciate his sense of humor and knowledge of the material (which, by the way, spans ALL of physical geography). While doing an excellent job in the classroom, Derek has submitted proposals for an NSF DDRI grant and an EPA Star grant, done well in his own classes, and designed his dissertation research. In February 2012, he competed for and was awarded a grant from OIT to enhance the delivery of Geography 131 and 132 with technology. He is an excellent teacher-scholar and a great role model for undergraduate students. 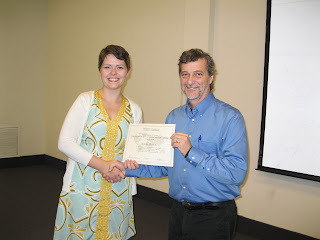 THE ROBERT G. LONG OUTSTANDING GRADUATE STUDENT AWARD: M.S. Matthew Cook successfully defended his thesis recently and he plans to turn his thesis into a peer-reviewed article. Matt received $3400 in grants for his fieldwork research in Berlin from the McClure Scholarship for the Study of World Affairs, a Maria Harris Award from the German Program at UT, and a McCroskey award from our department. 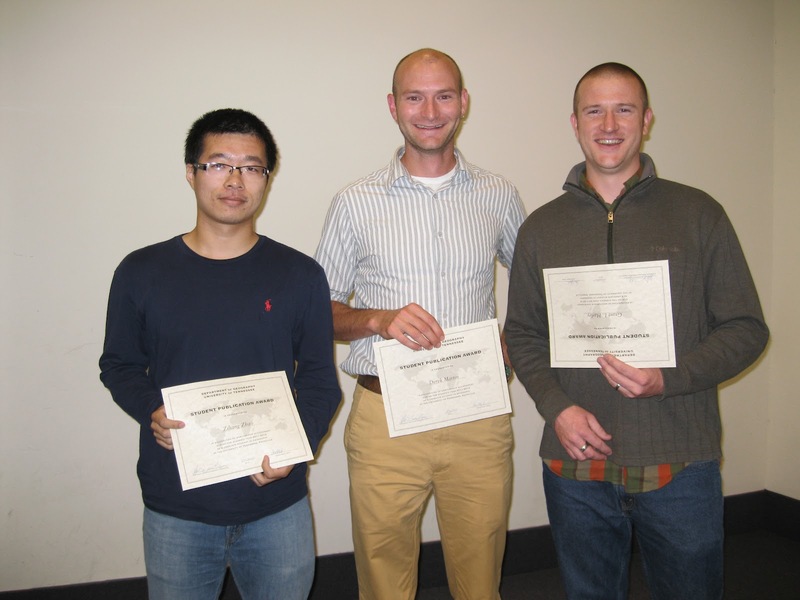 Matt has presented three papers at conferences and two posters at local meetings. Matt recently won the Master’s Student Paper Competition of the AAG Cultural Geography Specialty Group, and he served as a student member on the European Geography Specialty Group. 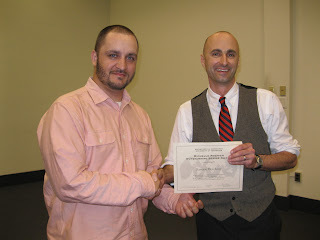 Matt also exemplifies leadership and collaboration in the department. He was the Tennessee Team Captain at the Geography Bowl at the SEDAAG conference in Savannah, Georgia in 2011, and he is a co-founder (with Melanie Barron) and leader of the Graduate Student Reading and Discussion Group in our department. Matt is always willing to share his grant proposals and IRB proposal with fellow students, setting an important example of sharing. Melanie Barron represents all we expect in a masters student in our department. She's been tirelessly dedicated to her research, to service to and for the department, and to the community at large. Melanie has worked on a NSF funded research project and has accomplished all of her tasks with professionalism and an attention to detail, often working late and on weekends to meet research deadlines. In addition, Melanie has become a 'go-to' graduate student when it comes to organizing events in our department. She was instrumental in helping to pull off the graduate recruitment weekend (even though she was also being recruited). She is a leader in our department and is well respected by her colleagues. She also has helped recruit new members to the local union and has worked with Cassie Watters in this regard. Finally, Melanie has presented her research at conferences and has begun to develop a professional network of students and faculty from across the country who have taken an interest in her work. We can think of few students more deserving of Melanie for this award. THE ROBERT G. LONG OUTSTANDING GRADUATE STUDENT AWARD: PH.D.
Grant Harley has been a solid graduate student in his four years here. Since he matriculated in Fall 2008, Grant was the lead presenter or co-author on 15 presentations, including SEDAAG (2009, 2010, and 2011) and AAG (2010, 2011, and 2012) and several other regional conferences. Grant has nine publications, six as lead author, in such journals as Trees-Structure and Function, Tree-Ring Research, Journal of Environmental Management, and Journal of Cave and Karst Studies, research that covers biogeographical, ecological, and archaeological projects. Grant served as a National Science Foundation Graduate Fellow for two years on the GK-12 project on which Dr. Horn was lead PI, served as the graduate student representative to the departmental faculty, served as President of GARG, and served as a Group Leader at the North American Dendroecological Fieldweek in 2012. He procured funding for his doctoral research through the National Science Foundation’s Doctoral Dissertation Research Improvement Grant program and received a Yates Fellowship from the Graduate School to further his doctoral research. He has assisted his graduate student colleagues in fieldwork conducted in Tennessee, Florida, all over New Mexico, Georgia, and many places in Virginia. Grant has culminated his outstanding graduate career by procuring a tenure-track position as Assistant Professor in the Department of Geography and Geology at the University of Southern Mississippi beginning this August. Grant truly represents all that we expect from a recipient of the Robert G. Long Outstanding Graduate Student Award. Here is Matt Valente's award-winning film, first screened at the Geography Department's Award Ceremony April 26, 2012. 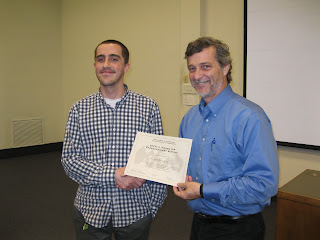 Congratulations to John Eads, recipient of the 2012 Excellence in Field Work award, and to Matt, recipient of our inaugural media award for creating a video celebrating John's accomplishment. 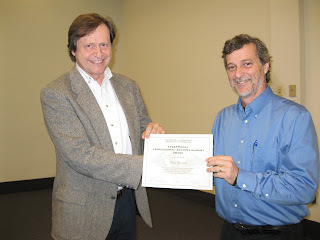 Matt Cook was awarded a prize by the Cultural Geography Specialty Group at the annual meeting of the Association of American Geographers in New York City. Matt's paper “Memorializing Berlin’s Holocaust Past: Gunter Demnig’s Stolpersteine Project” won the best Master student paper prize. Grace Levin (Global Studies major, Geography minor) won a prize in UT's Exhibition for Undergraduate Research and Creative Achievement (EUReCA) competition. Her poster, "A Critique of Social Enterprise: The Global Impact of a Microfinance Crisis in India," was one of four winning posters in the Humanities and Social Sciences category. Grace's Faculty Mentor is Micheline van Riemsdijk.